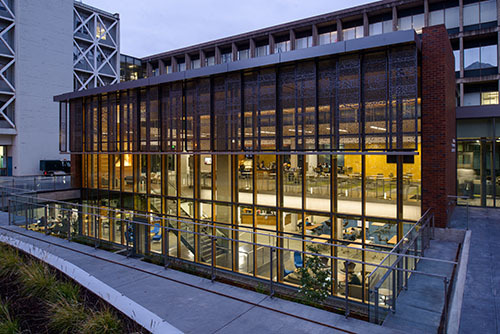 The University of Oregon Price Science Commons Library reopened October 2016 after 20-months of design work and construction with project partner, Andersen Construction. Total project budget was $19.5 million. The newest library at the University of Oregon was designed by Opsis Architecture. The Allen Price Science Commons and Research Library was built to support an unprecedented integration of the sciences in UO research and education while remaining adaptable as information technology continues to evolve. It is expected to achieve LEED Gold certification. The $19.5 million project opened this October 2016 after 20-months of design work and construction with project partner, Andersen Construction. Adds a light-filled commons area that rises above the concrete plaza between Willamette Hall and Onyx Bridge in the heart of the Lorry I. Lokey Science Complex. With a 72 percent surge in the number of science majors since 2000, the science library had long ago outgrown its former underground space, which had just one significant update in its 45-year life — two decades ago. The positive response to the new facility exceeds the library staff’s most optimistic expectations, according to Adriene Lim, UO Libraries dean and Philip H. Knight Chair.